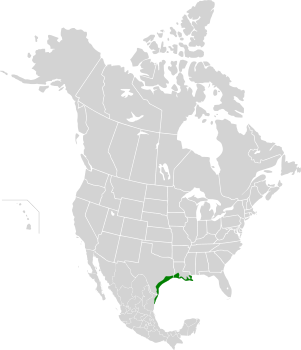 Western Gulf coastal prairies are subtropical grasslands that were formerly widespread along the coastal plains of Texas and Lousiana. Bluestem and Indian grasses, common components of tall grass prairies to the north, also grow here. Near the coast and on wetter locations the coastal prairies often merge with freshwater, brackish, and salt marshes. Drier soils host cactus, mesquite, Texas persimmon, and prickly ash. Hurricanes and lightning-induced fires maintain these prairies where herds of bison used to graze. Groves of Texas palms (Sabal texana) occur in the lower Rio Grande valley because the river serves as a fire break that protects this non-fire adapted species. Palm groves grew as far as 50 miles inland during the 19th century, but now there are only 100 acres left, most notably in the Sabal Palm Sanctuary located in Cameron County, Texas. Coastal prairies have also become rare–less than 1% of these remaining unique grasslands are considered pristine. Most have been converted to agriculture. Location of coastal prairies. This environment was likely more widespread during Ice Ages when dry land extended into the Gulf of Mexico for 50 miles. A grove of Texas palms. Paradoxically, this environment may have been more widespread during Ice Ages. Coastal prairie adjacent to a salt marsh in the Aransas National Wildlife refuge. 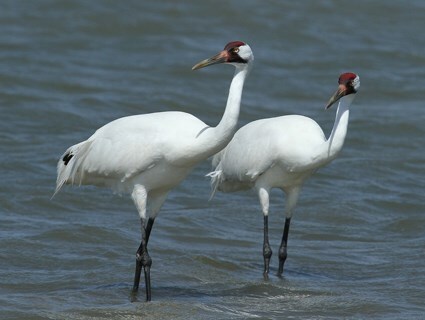 Coastal prairies support 1 of the 2 remaining populations of whooping cranes. Palm groves and coastal prairies were likely much more widespread during Ice Ages of the Pleistocene. Glacial advance caused the Gulf of Mexico to recede, resulting in a larger region of dry land where both environments could expand. The prairies served as a corridor that facilitated the movement of western and South American flora and fauna into southeastern North America. Prairie chickens, upland sandpipers, and 13-lined ground squirrels are some western species that lived in the south during the Pleistocene. Ground sloths, glyptodonts, pampatheres (a type of giant armadillo), and mixotoxodons (a large primitive ungulate) used the corridor to advance from South America to what today are the southern United States. The coastal grasslands supported great herds of grazers including mammoths, bison, horse, and giant tortoises. These in turn attracted large predators such as lions, scimitar-toothed cats, and dire wolves. Paradoxically, this region may have been warmer during the coldest stages of Ice Ages. Glacial meltwater periodically flushed into the North Atlantic, shutting down the Gulf Stream (the tropically heated water that flows into the North Atlantic and keeps climate mild). This caused average annual temperatures in the upper and middle parts of North America to plummet. So this tropically heated water stayed in the Gulf of Mexico, making average annual temperatures in this region warmer than modern day temperatures. The geographical location of the transition between the colder region of the continent and the warmer region may have been abrupt, perhaps explaining why species with northern affinities are often found associated with warm climate species in so many Pleistocene-aged fossil sites. This transition zone likely shifted frequently, on a decadal or even annual basis. Conversely, during interstadials when the Gulf Stream restarted, the middle latitudes enjoyed warmer average annual temperatures (but not as warm as those of today), while the region adjacent to the Gulf of Mexico cooled down (perhaps cooler than modern day temperatures). Changes in the composition of flora and fauna lagged behind these sudden climatic changes. 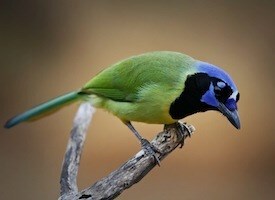 The lower Rio Grande valley is the northern limit of many tropical species found nowhere else in the United States. Bird watchers can find red-crowned parrots, green parakeets, brown jays, green jays, chacalacas, groove-billed anis, Altamira orioles, Aplomado falcons, and common paroques here. These tropical species likely spread across the region during stadials when the climate was warmer, but they experienced range reduction during interstadials. 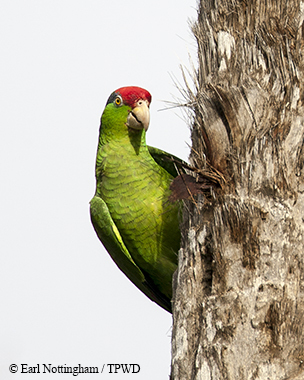 Red-crowned parrots recently colonized south Texas. Woodpecker-excavated cavities in frost-killed palms provide perfect nesting for them. The woolly mammoth (Mammuthus primigenius) will roam the earth again and soon, thanks to new advances in genetic engineering. The new technology is based upon another fairly recent discovery known as CRISPR, an acronym that stands for clustered interspaced short palyndromic repeats. Scientists discovered CRISPR when they were studying how a bacteria’s immune system works. Viruses often attack bacteria. To develop immunity to the viral infection, the bacteria cut and paste fragments of the virus’s DNA into its own genome. Jennifer Douda and Emmanuelle Charpentier realized they could use this process to cut and paste desired changes into an organism’s genome. They engineered the protein CAS9–2 RNA molecules that made it easy to cut and paste characteristics of 1 species into another species genome. Feng Chang and Georgie Church were the first scientists to use this technology on a human cell, and now there is a big patent dispute between Chang and Douda over who deserves the monetary reward for this potentially lucrative invention. As early as 2018, George Church of Harvard University plans to cut and paste certain characteristics of the woolly mammoth into an Asian elephant (Elephas maximus) embryo that will then be implanted in an elephant. If this project is successful, the woolly mammoth will be reborn. Scientists recently sequenced the genomes of 3 Asian elephants and 2 woolly mammoths. (They were able to extract DNA from woolly mammoth carcasses preserved in Siberian permafrost.) The Asian elephant is the closest living relative of the woolly mammoth. The study confirmed the common ancestor of both species diverged about 5 million years ago. The genetic evidence shows since that divergence the woolly mammoth evolved many adaptations to frigid environments. Woolly mammoths evolved thick fur, short ears, a thick layer of fat, a hump of brown fat between the shoulders, reduced sensitivity to cold, enlarged sebaceous glands, and an altered circadian rhythm response. Sebaceous glands secrete oil into hair for lubrication. This made woolly mammoth fur waterproof and would have helped them keep warm in wet conditions. The altered circadian rhythms were an adaptation to the extreme changes in day length that occur in the upper northern hemisphere. These are the woolly mammoth characteristics Georgie Church will cut and past into an Asian elephant embryo. Eventually, woolly mammoths could populate an experimental Pleistocene Park located in Siberia. Herds of woolly mammoths could co-mingle with caribou, moose, horses, bison, yaks, Saiga antelope, and camels. The foraging and trampling of all these animals compacts the soil, keeping the permafrost intact. Scientists believe this could help mitigate the effects of global warming, so there is a practical purpose for re-introducing woolly mammoths to the environment. I know it would be a tremendous tourist attraction and hopefully some day much of Siberia will be overrun with megafauna. View of the experimental Pleistocene Park in Siberia. The re-introduction of horses has increased the grassland cover here. I was confused about the Harleyville Giant Cement Quarry fossil site for many years. Some of the scientific literature reported the fossils found there were over 300,000 years old, while other papers gave them an approximate age of 20,000 years BP. Finally, someone sent me a message, clearing up my confusion. These are 2 different fossil sites–both in Dorchester County, South Carolina but several miles apart. In 1989 Roy Ogilvie, an amateur fossil collector, found a nearly complete dire wolf skull at the site with the 20,000 year old bones. This specimen is now stored at the U.S. National Museum and was given the number 437648. It is the only dire wolf (Canis dirus) skull ever found in South Carolina, though several isolated teeth have been recovered from other sites. Photo of specimen #USNM 437648 from the below referenced book. It’s nearly complete, missing just a few teeth. The size of this skull is remarkable. Ronald Nowak, a renowned fossil canid expert, measured 62 dire wolf skulls that were excavated from the La brea Tar Pits in California. #USNM 437648 is larger than all of them. It may just be coincidence, but perhaps eastern dire wolves were on average larger than their western counterparts. In any case this was a big wolf. However, it is not the largest dire wolf skull known. A dire wolf skull from south Texas and another from the Maricopa tar seeps in California were slightly larger than this specimen. The associated faunal remains, known as the Ardis local fauna, suggest #USNM 437648 lived in a mostly wooded habitat with some grassy openings and aquatic habitats. Tapir, white-tailed deer, stout-legged llama, long-nosed peccary, woodrat, beaver, gray squirrel, flying squirrel, jaguar, Florida spectacled bear, and Jefferson’s ground sloth all are (or were) denizens of woodlands or even deep forest. Mastodon, beaver, and river otter indicate wetland habitat. Bison, horse, mammoth, meadow vole, hog-nosed skunk, 13-lined ground squirrel, and pampathere show that grassland environments existed here as well. Dire wolves were a generalist species. Specimen #437648 likely hunted in all 3 habitats. The ancestor of the jaguar diverged from ancestral lions and leopards about 8 million years ago. An extinct species of jaguar (Panthera gombaszoegensis) roamed Eurasia from the early to mid Pleistocene (1.5 million years BP- ~300,000 BP). This species crossed the Bering Land Bridge over 500,000 years ago and colonized North and South America where it evolved into Panthera onca–the same species still found today from Arizona to Argentina. The jaguar had a much wider range in North America during the late Pleistocene than it does now. Jaguar bones, dating to this era, have been excavated from sites as far north as Washington state, Oregon, Indiana, West Virginia, and Pennsylvania. I’ve reviewed the data from these sites in an attempt to determine when jaguars ranged this far north. I was curious to know if jaguars were able to survive that far north during the coldest climatic phases. However, these sites are all cave deposits without reliable dating evidence. Associated faunal remains may be from specimens thousands of years older or younger than the jaguar remains and because climate often fluctuated rapidly during the Pleistocene, they can’t be used as an index for the climatic conditions that occurred when the jaguars lived in the regions. The ancestor of Panthera onca did negotiate the Bering Land Bridge and Canada to reach its known Pleistocene range. This region was quite cold even during warmer climate phases, so I believe Pleistocene jaguars were more adaptable to climatic extremes than one might expect. There’s just not enough evidence to know for sure. Both extinct subspecies of Pleistocene jaguars were somewhat larger than present day jaguars. Pleistocene jaguars were abundant in southeastern North America, rivaling dire wolves (Canis dirus) as the most common large predator in the region then. Jaguars have been unearthed from at least 18 sites in Florida, 6 sites in Tennessee, 2 sites in Georgia, 1 in South Carolina and another in Alabama. A jaguar fell into Craighead Caverns in Tennessee and even left paw prints and claw marks in its failed attempt to escape the natural trap. Complete skeletons of jaguars have been found in other Tennessee caves. 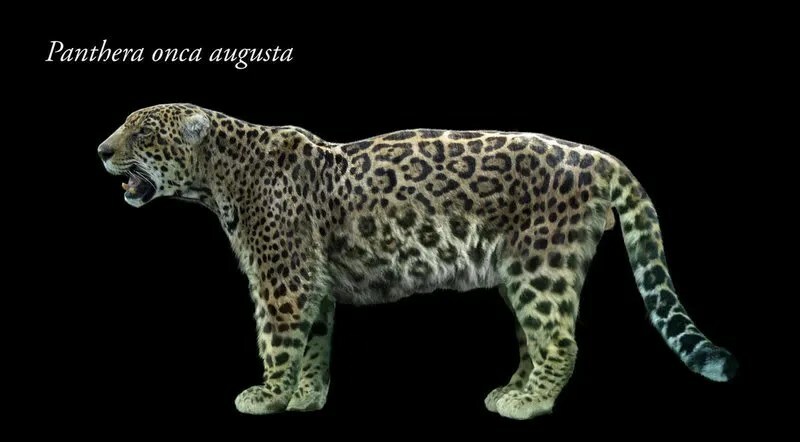 The jaguar that lived in the southeast during the Pleistocene was a distinct subspecies known as Panthera onca augusta. It was given subspecies status based on its size, averaging 15%-20% larger than the modern jaguar. Extant jaguars still demonstrate clines (geographical variations in size). Present day jaguars average larger in the northern and southern limits of their range than they do near the equator. Larger individuals maintain body heat more efficiently, perhaps explaining the size difference in the cooler parts of their range. Present day jaguars also grow larger in areas where they can prey on livestock. So it’s likely the combination of cooler climate and larger prey contributed to the larger size of P. onca augusta during the Pleistocene. Another extinct subspecies of jaguar lived in South America–P. onca mesembrina. This population of jaguars also averaged larger than present day jaguars. A study of P. onca mesembrina genetics determined this clade became extinct in southern Argentina about 12,280 calendar years ago along with other regional megafauna including Darwin’s ground sloth, horse, a llama (Lama gracilis), and a local population of guanacos(Lama guanacoe). These clades of jaguars and guanacos left no descendents, but other clades of these species recolonized southern Argentina less than 2,000 years later. The scientists who participated in this study conclude human activities combined with a warming climate phase caused megafauna extinctions here. Southern beech forests expanded as temperatures and precipitation increased, and the forest encroached on the grasslands. Herds of grazing animals, forced to migrate greater distances to reach suitable pastures, were more easily ambushed by an increasing human population that now had access to more wild plant foods in the growing forests. Megafauna survived previous climate changes by altering their patterns of movement throughout the landscape, but some how humans disrupted this during the terminal Pleistocene. I started this blog in March 2010 to promote my self-published book–Georgia Before People: Land of the Saber-tooths, Mastodons, Vampire Bats, and Other Strange Creatures. I gradually began to enjoy researching and writing articles for this blog so much that I forgot all about promoting my book. I try to keep this blog focused on the paleoecology of southeastern North America during the late Pleistocene. However, scientists aren’t publishing research fast enough to keep up with my prolific output, so I often turn to topics barely relevant or even unrelated to my preferred subject. To celebrate my 500th post, I went through all of my past articles and categorized most of them. The categories can be found on the right hand side below the archives. The categories include Pleistocene mammals, ornithology, herpetology, ichthyology, invertebrates, geology, anthropology, natural history expeditions, and standing on my soapbox. The category of natural history expeditions are articles about my vacations. I try to avoid politics on my blog but haven’t always succeeded. Political articles are under the category of Standing on my Soapbox. Thank to everyone who has taken the time to read, follow, or link my blog. Some of my wife’s relatives are chicken farmers. Modern day poultry farmers raise chickens in long metal warehouses containing as many as 30,000 birds. The warehouses smell like the inside of a toilet bowl that hasn’t been flushed or cleaned in a year. Chicken farmers have to walk through each of their warehouses twice a day to collect and dispose of dead chicks. This task prevents the spread of infectious diseases. Agricultural catalogues sell Israeli gas masks for poultry farmers, so they won’t get sick from working inside their warehouses. Wild chickens have a better quality of life than the birds that spend their entire lives inside these awful concentration camps. At least they get to breathe fresh air and live naturally. According to the paleobiology database, chickens formerly lived all across Eurasia. The bones of extinct species of chickens have been unearthed at 8 sites in Europe. These extinct species lived from the late Miocene to the early Pleistocene. But when Ice Ages began occurring, the range of the chicken was reduced to southeast Asia. Now, there are 4 or 5 species of chickens, but many additional species existed when earth’s overall climate was warmer. Chickens require warm tropical/semi-tropical river valley forests where they can forage for seeds, fruits, and insects on the ground. They can’t endure harsh temperatures. Curiously, there are no known Pleistocene-aged fossils of chickens from their current range, though they undoubtedly abounded in the region then. Bone preservation is uncommon in lowland tropical forests because of the acid soils. Distribution map of the red jungle fowl, 1 of the ancestors of the domesticated chicken. Research of the origin of chicken domestication is confused and contradictory. Zooarchaeological and genetic evidence suggests chickens were first domesticated in northern China about 8,000 years ago. However, some scientists re-examined the zooarchaeological evidence and determined the chicken bones were misidentified. Instead, these supposed chicken remains are actually pheasant bones. They also note that chickens are and were not native to northern China, a temperate zone region. The fauna associated with the pheasant bones consisted of temperate species such as red deer, sika deer, and wild boar. The species of mammals that co-occur with wild chickens including rhesus macaques, Asian elephants, and rhinos were absent from this region. Northern China is just too cold for chickens, and it’s far more likely they were first domesticated in their native range of southern China. By 3000 BP chicken farming had spread to northern China where the birds could survive winter with human help. The modern farm-raised chicken is a hybrid cross between 2 species–the red jungle fowl (Gallus gallus) and the gray jungle fowl (G. sonneratii). 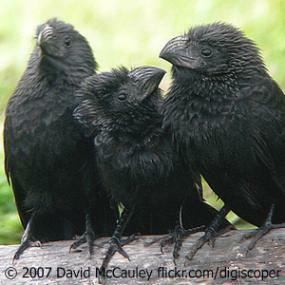 Genetic evidence suggests the yellow skin pigment descends from the latter species. Feral chickens occur locally in many towns and cities across southeastern North America including Miami, Key West, St. Augustine, Houston, New Orleans, and Fitzgerald, Georgia. Chickens living in Fitzgerald descend from a population released along the Ocmulgee River. The Georgia State Fish and Game Department hoped the birds would become a popular target for hunters. Instead, the chickens abandoned the river bottomland forest and moved into suburban areas of the nearby town where they have thrived for decades. Their preference for human-modified habitats may mirror their close ties to habitats modified by elephant foraging in their native range. Elephants expand and maintain open areas, and they knock fruit to the ground. Their manure attracts insects and contains undigested seeds. Wild chickens benefit from the presence of elephants. In suburbs humans maintain the open areas and accidentally provide food for chickens. Feral chickens in Fitzgerald, Georgia. Some people love suburban wild chickens, while others (the get-off-my-lawn assholes) resent the crowing and droppings. I like free-ranging chickens better than grouchy old people. Eriksson, J; and et. al. You are currently browsing the GeorgiaBeforePeople blog archives for July, 2016.